Aydin Senkut's early stage investment firm, Felicis Ventures, just moved into a bigger office last week, for more room to bring in founders of his portfolio companies. 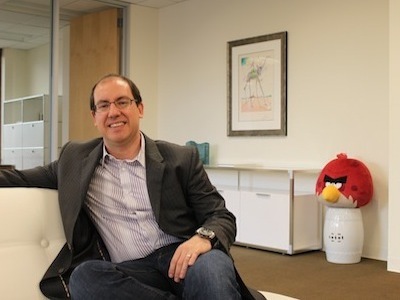 Senkut's firm was an early investor in Rovio, and it's clear the firm is proud of its investment from the number of fluffy Angry Birds scattered throughout. "Everybody says that they are different. It's like when you walk to an Apple store versus when you walk into any other retail store. The first thing we want people to see is that this is not set up like a typical venture fund, it looks like a living room," Senkut said. Senkut spent three years working out of a cafe, meeting with founders to see if he wanted to invest in them. Senkut was the first ex-Google angel investor, and was able to have some good exposure early on. But working by himself got lonely, so he raised a $40 million seed fund to expand Felicis Ventures. Senkut said the most exciting areas poised for growth is mobile. "I really do believe there will be a billion dollar company created in mobile," Senkut said. The firm continues to focus on investments in mobile, e-commerce, enterprise, cloud, education, and health. "We don't worry about competition and what's happening because we are confident in the areas we've picked. We've proven that we can pick winners in those areas," he said.